Caterina Graziano first appears in Painesville, Lake County, Ohio, in 1916. When Caterina and her three children immigrated to the United States, Painesville, Ohio, was their destination. They were joining the family’s father, Tommaso Messina. In America, Caterina Graziano was known Catherine Messina. Caterina Graziano, daughter of Francesco Graziano and Rosa Carolla, was born on Thursday, August 5, 1886, at Palermo, Palermo Province, Sicily. Caterina married Tommaso Messina, son of Salvatore Messina, about 1906, at Sicily. Caterina died on October 16, 1940, at her home, 433 North Saint Clair Street, Painesville, Lake County, Ohio, at age 54, of a cerebral hemmorhage. Her body was interred at St. Mary Cemetery at Painesville Township, Lake County, Ohio. 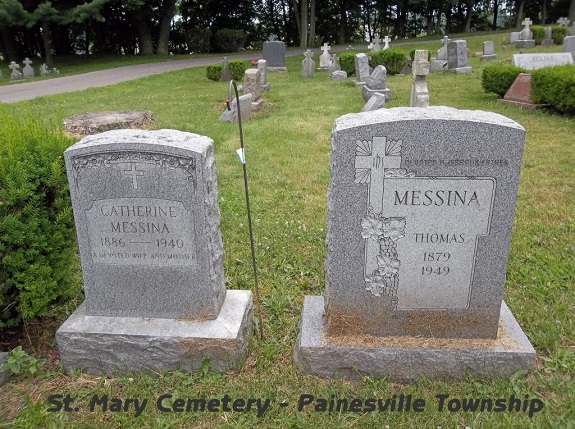 Caterina Graziano was enumerated for the 1920 Census of the United States, on January 13, 1920, living at 219 Storrs Street, Painesville, Lake County, Ohio, as the wife of Tommaso Messina. She was enumerated as Katherine Masina. 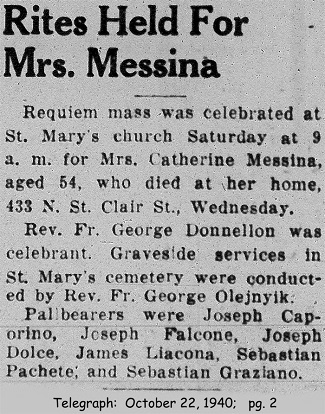 Caterina Graziano was enumerated for the 1930 Census of the United States, on May 1, 1930, living at 431 North St. Clair Street, Painesville, Lake County, Ohio, as the wife of Tommaso Messina. He was enumerated as Katherine Messina. Caterina Graziano was enumerated for the 1940 Census of the United States, on April 4, 1940, living at 433 North St. Clair Street, Painesville, Lake County, Ohio, as the wife of Tommaso Messina. He was enumerated as Katherine Massina. Caterina Graziano immigrated to the United States on September 28, 1916, at age 30. Caterina and her three children were traveling to 211 Storrs Street, Painesville, Ohio, to join her husband Tommaso Messina. Caterina entered the United States at the Port of New York City aboard the ship SS Dante Alighieri.